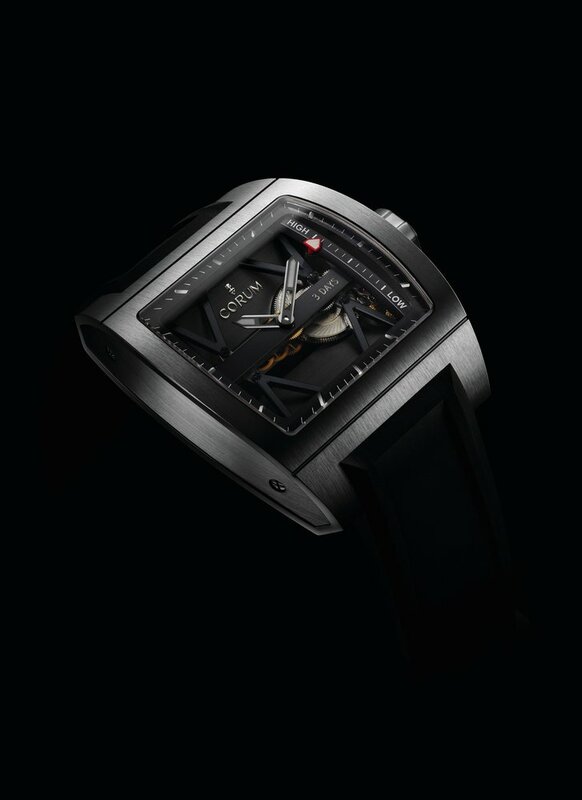 The Ti-Bridge Power Reserve,the second model in this year’s bridges collection from CORUM, with its distinctive titanium case and its horizontal baguette movement is held by four black PVD-coated bars, is a contemporary interpretation of the Golden Bridge spirit. Unique in the world, this understated blend of modernity and elegance features a perfect balance between design and technology. The Caliber CO107 baguette movement equipping the latest Ti-Bridge model drives the hour and minute hands as well as a power-reserve indication – a first in this collection. This beautifully structured watch naturally called for a linear display of the latter function. To achieve this, the Caliber CO107 is fitted with a satellite gear train that is visible when observing the watch from the side along the 9-3 o’clock axis, but invisible when looking at this Ti-Bridge from the front. This module comprises several specific features, including a differential gear system composed of three wheels – one of which is an off-centered “planetary wheel”. Depending on the direction of its rotation, the latter spins either on its own axis, or around the axis of the two other wheels, thereby connecting the barrel on the one hand and the winding stem on the other to the power-reserve indicator – all within a minimum of space. Another special characteristic developed for this caliber is the power-reserve indicator mounted on a graduated sliding gear in phosphate nickel. The choice of this material, combined with a LIGA manufacturing process (a German acronym for Lithographie, Galvaniformung, Abformung – Lithography, Electroplating and Molding) similar to electroforming, results in parts with far more precise tolerances than those achieved by classic mechanical machining. It thereby guarantees the extreme precision of the power-reserve display, which in this case amounts to a maximum of three days. In terms of the exterior, the new Ti-Bridge Power Reserve features a grade 5 titanium case and a dial in titanium. The hour and minute hands as well as the power-reserve display are coated in a luminescent substance so as to ensure perfect readability in the dark. Fitted with a rubber strap secured by a folding clasp with two security pushers, the Ti-Bridge Power Reserve is issued in a limited numbered series of 700.